As adults get older, staying properly hydrated can become a problem. 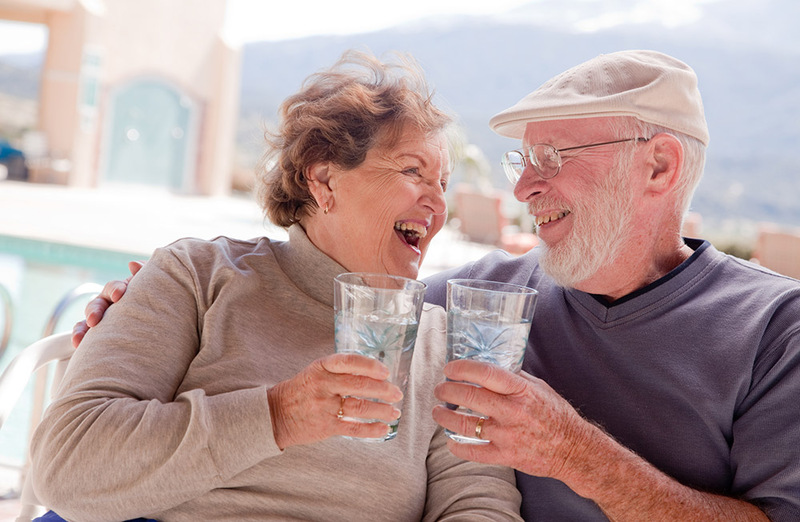 Adults over 60 are more susceptible to dehydration. In fact, dehydration is one of the top reasons for hospitalization in seniors. Is your aging loved one drinking enough? Keep on top of the problem by knowing what causes it and how to prevent it. Staying hydrated is key! The main cause of dehydration is not drinking enough water, but there are other factors that may lead to dehydration in seniors. Illness, medications and the aging body are all factors when it comes to dehydration. Diarrhea, vomiting, or blood loss will rapidly dehydrate the body. A person with dementia or Alzheimer’s may not be aware of how much they are drinking during the day. Also, some medications are diuretic or cause sweating. So, always talk to the doctor about potential side-effects of medications, and be sure to take the correct dose at the right time of day. The aging body can make it more difficult to stay hydrated. Mobility issues might make it difficult for seniors to get their own water. Others may not feel thirsty, even when they are dehydrated. To combat this, keep a bottle of water on the end table or nightstand for your loved one. If you think your loved one is dehydrated, check for a decrease in skin turgor by pulling the skin on the back of the hand. If it does not return to normal almost immediately, the person is dehydrated. Taking small sips of water or eating water-rich fruits like apples are great ways to rehydrate. However, when a person is extremely dehydrated, they lose more than just water—they also need the electrolytes replenished in their bodies. Try this homemade electrolyte lemonade. 1 In a large mason jar, dissolve honey in a small amount of warm water. The caregivers at Anita’s Angels are well trained in taking care of your loved ones. Call 908-788-9390 to talk about your options for aging in place.